In this video [@0:10] Avicii can be seen sitting in a Herman Miller Aeron chair. The chair Skrillex is using at the desk where he produces is a Herman Miller Aeron Chair, which can be distinguished by the "woven" look and the V-shaped frame on the back (seen at the very end of the Vine video). You can see the Amazing Chair in his newest Instagram Post. Take a Seat! Long studio sessions require good back support. Our team's sharp eyes spotted Aoki sitting on a Herman Miller Aeron Chair. Tommy Trash shows good taste with selecting the Aeron chair for his music studio. We spotted Headhunterz sitting on a Herman Miller Aeron Chair in a video of him in the studio. 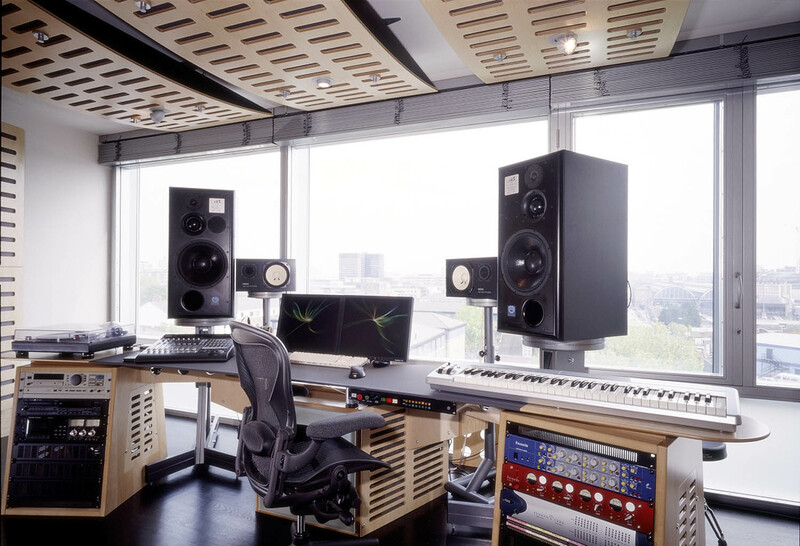 A pair of Aeron chairs can be seen in photos of Bingo Players' studio setup. At 1:12 in the video, Showtek can be seen sitting in Herman Miller Aeron Chairs in their studio space. Kill The Noise share an Instagram pic of their Herman Miller Aeron Chair: "Early Xmas gift! Might not seem like much but the most important part of a good studio is a good chair! Thanks @sharsharbean"
Eva Shaw together with Showtek, during the N2U production, using the Herman Miller Aeron Chair. You can see Steve sitting in the Herman Miller Aeron Chair in his studio. Ergonomic chair, great for back support and long days in the studio. Worth the investment. In this Instagram post, Flume Herman Miller Aeron chair can be seen in front of his desk. He's got one in his studio. In this picture from Otto's Instagram, you can see the Herman Miller Aeron Chair in front of his computer and speakers. Spotted in a photo of Robert Miles' studio on the [SEA blog](https://seauncut.wordpress.com/2010/03/11/atc-monitore-bei-robert-miles-neuem-solo-projekt/). When im producing i need to be confortable so with this chair i got back support,really useful & keeps you healthy. We have 4 of these!!! The best investment in my studio - period. I was getting a lot of pains in my back until investing in this beauty - I got it secondhand refurbished for a good price. Well worth it - no more back pain. I love this chair after sitting long hours producing music it support my back. No I need this actually. It's time for a new chair and this looks comfortable.